So many names. Eggplant, brinjal, melongene, Guinea squash, or aubergine if you’re feeling fancy. It’s like this veg is creating new accounts to keep getting the one month trial…whatever he wants to be called, I’m a big fan. This dish is super easy to knock together and its awesome comfort food without the stodge. Cut the top off the eggplants and slice them lengthways in 1 cm slices. Lay the eggplant slices in a single layer on baking trays lined with baking paper. Brush the eggplant slices lightly with a little EVOO. Bake for 30 minutes, flipping over halfway through. 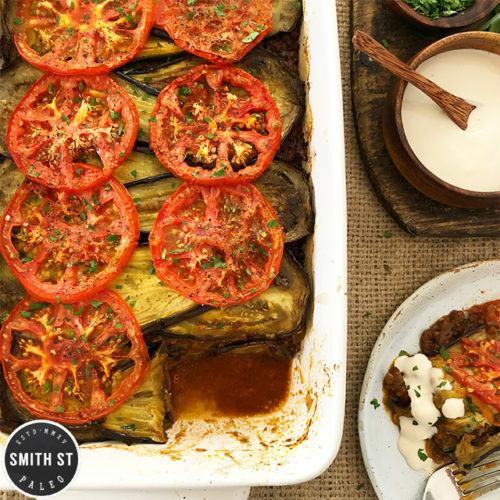 While the eggplant is baking, heat some EVOO in a large pan. Sauté the diced onion and crushed garlic to soften. Add the mince and fry until browned. Add all the spices, tinned tomatoes and tomato paste, pomegranate syrup and salt and pepper. Combine well, lower heat and simmer until reduced slightly and flavours have melded. Remove from heat. Using a large ovenproof dish (like a lasagne dish), layer the bottom with a single layer of tomato slices. Then add a layer of eggplant slices (these can overlap slightly like I’ve done in my pic). Spoon on the mince mixture and spread out evenly. Top with another layer of the eggplant and then a final layer of tomatoes. Sprinkle with a little S & P and return to the 200 degree oven for another 30 minutes. Totes delish served with a simple salad of cucumber, tomato, red onion and mint and a blob of tahina sauce is always a win.